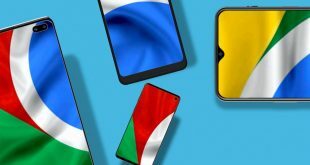 Taking a screenshot on Android is simple. Just press and hold the Volume Down and Power buttons for a second, and your phone will take a screenshot. 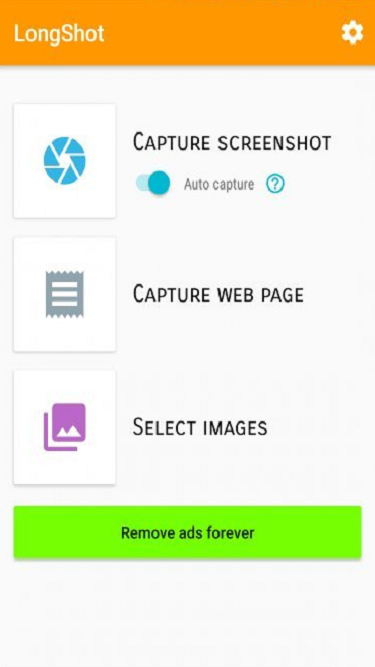 Depending on the Android model, the screenshot will show up in your Gallery app. But what if you have to take long screenshots? The problem arises when you have to keep scrolling and take multiple screenshots because your phone is not smart enough to take a scrolling screen capture. 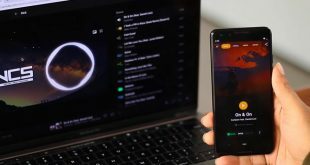 Taking a hint, Xiaomi introduced the scroll screenshot feature in MIUI and pretty soon, OnePlus followed suit with its flagship device, OnePlus 5. Samsung Galaxy S8 also offers this out of the box. 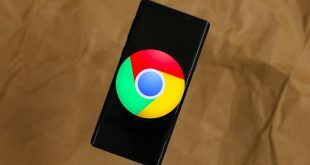 But, not every smartphone (especially if it’s running a stock Android) is capable of taking long or scrolling screenshots, which is why there are third-party apps available in the Play Store. 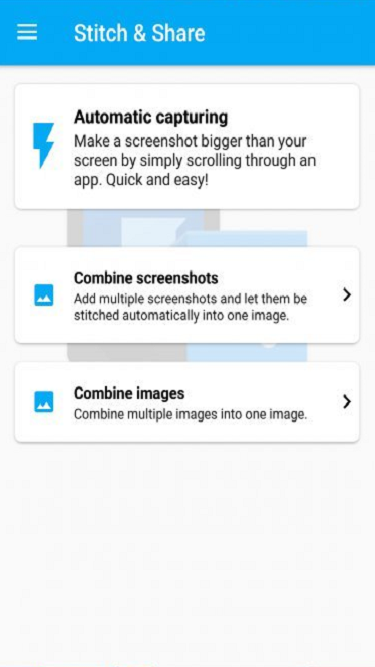 Let’s take a look at 3 apps that will take multiple screenshots automatically and stitch them together to create a long screenshot. Stitch and Share is a simple to use app that creates a shortcut button on your screen. Here is how it works. Launch the app and give it necessary permissions. There are three options. We will go with Automatic capturing. You will see a popup asking you to confirm your choice. Click Start Now. You will be taken to your home screen where you will now see a floating shortcut on the left screen. Open the app where you want to take the screenshot. In my case, it is Chrome. Click on the Start button once to begin capturing. You will now see a Save button on the right side of your screen. Scroll slow 60-70% of the screen at a time. Every time you scroll, the save button will disappear momentarily. This means the app is working. When it appears back, scroll again. Repeat until you are done. Hit the Save button and you will be taken back to the app. You should now see your long screenshot. The app also comes with some editing options like the ability to highlight/redact text in different colours and ability to remove parts of the screenshot. You can either save the final version on your SD card or you can also create a link that you can share with others. Price: The app is free to use but will add a watermark at the bottom of each image. It is also ad-supported. You can upgrade (0.99) to remove both. Verdict: Stitch and Share is a neat little app that is easy to use and simply works. The premium version is not expensive and if you are someone like me who constantly has to deal with screenshots, it’s a no-brainer. 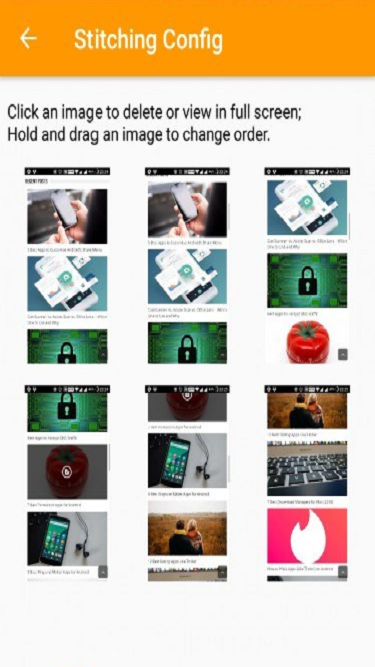 Unlike Stitch and Share, which joins multiple screenshots vertically, Screenshot Join takes a different approach. You can join only two screenshots which somewhat limits the app’s capabilities. This reduces screen space that you would have otherwise shared. However, to take a different stance, the app also allows you to join screenshots horizontally. Here is how it works. 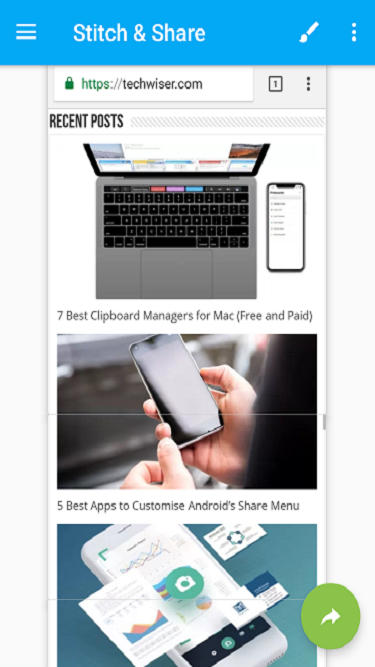 You launch the app and see empty slots for Image 1 and Image 2. You select the screenshots you want to join and the app will ask you how: Horizontally or Vertically. You can choose either and it will show you the final output before allowing you to save it to Gallery. Here is the final output in horizontal format since we have already seen other apps do it vertically. Price: The app works flawlessly and while it says the app is ad-supported, I wasn’t served any. But if you are seeing ads and want to remove them, there is a pro version available for $1.99. Verdict: The drawback is the number of screenshots you can join. It’s like an image join app really. Plus, it takes a manual approach which means you have to take the screenshot first and then open the app to join them. Too much hassle. LongShot offers the best of both the worlds. 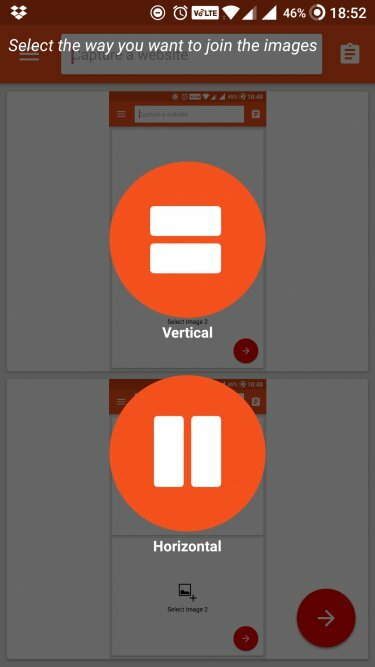 It will create a floating button to take long screenshots as well as allow you to choose images/screenshots to join vertically or horizontally. Plus, unlike Screenshot Join, there is no limit to the number of screenshots that you can join. The mechanics of the app remain the same as Stich and Share. On the home screen, there are three options. 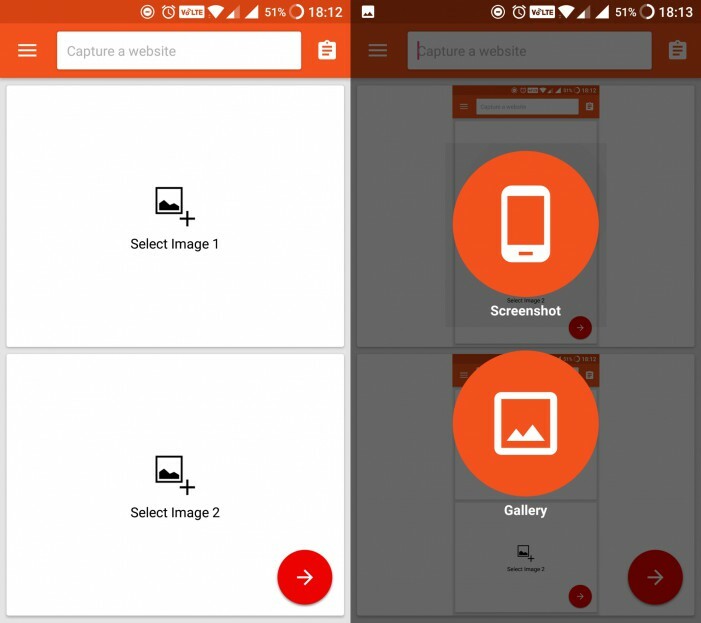 The first is Capture screenshot which will allow you to take a long screenshot. The second is Capture Web Page which is an inbuilt browser. 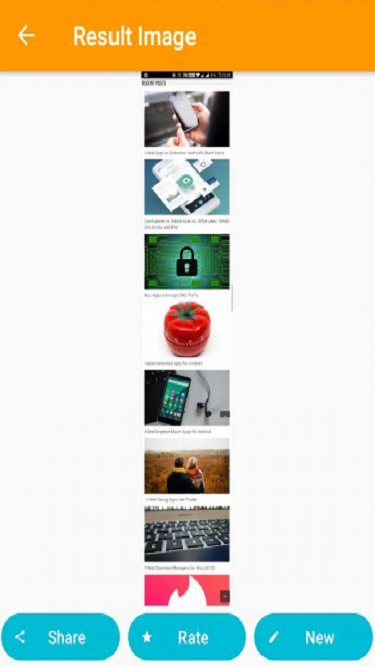 You can take a scrolling screen capture of any webpage here. 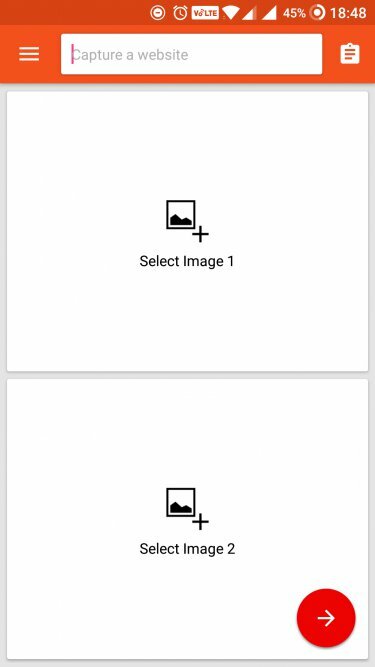 The third is Select Images where you can choose any image or screenshot manually to stitch it together. Click on Capture Screenshot to launch the floating button. Click on the green floating button when you are in position inside the app you want to screenshot. Here things are a little different. You will notice a red line. The app will ask you to scroll slowly and keep below the red line. I suggest you scroll 50-60% of the screen at a time. Once you are done, hit the red Done button and you will be taken back to the app. Here you will see multiple versions of the screenshots to choose from. On the bottom left, there is a Configure button. 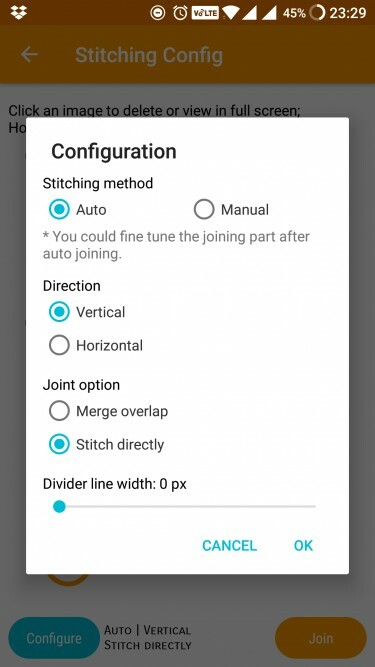 There is where you can choose between horizontal and vertical direction, stitching method which I kept to auto, and divider line which I left to the default value. On the bottom right of the screen is the orange Join button. Click it and you are done. The app will now show you the end result. A longshot. The app is ad-supported but all the features are available in the free version. The ads are themselves non-intrusive which means there is a red button near the ad you can use to close it. Verdict: Longshot is the most feature-rich app for taking long screenshots on Android. It is free and comes with a lot of configurable options. It only lacks editing tools that we saw in Stitch and Share. I like Longshot because it is free and offers more options. It comes with a built-in browser that makes taking long screenshot easier. Just mark and starting and end point and you are done. No need to scroll slowly. Stitch and Share is a good app for those who need the editing tool to redact or highlight certain parts of the screenshots. It is not entirely free but still worth the extra feature it offers. If you are using an HTC smartphone, there is a dedicated app for you. HTC Screen Capture Tool will help you achieve similar results.